The dojo.layout.TabContainer with dynamically adjustable height of each Tab. The height is specified for IE6 only. Try to add/remove the content of this Tab (use the buttons below). This Tab hash style="min-height:150px;height:150px;". The height is specified for IE6 only. For the dojo TabContainer widget we have to specify the exactly height of the dojoType="dijit.layout.TabContainer". The height that specified as 'auto' or '%' is ignored. You can see such structure in the DOM but not on the screen. The height of each ContentPane of the TabContainer is the same (see explanation below). If the predefined height is not enough for the contents of the ContentPane - the inner vertical scroll bar is appeared. This behavior of the TabContainer serves many situation. But if you want to avoid the inner scrolling you have to predefine a big enough (the bad 'measure') height, and the ContentPane(s) with a small amount of information will have the same height without any reason. If the content of a ContenPane is dynamically adjustable (can be increased/decreased) you have uncontrolled situation for rendering your information inside of the ContentPane. The doLayout="false" can help to solve problems related with the point 4, but it is buggy in IE (put mouse over here to see image ). The sentence: 'it is buggy in IE', has a different meaning here for the Dojo developers and me. For me, that means "dosn't work". it must be compattible with FF3, IE6-7(8), the latest version of Opera and Safary. Put doLayout="false" parameter for your dojoType="dijit.layout.TabContainer". The height is optional and used for initialization of the ContentPane in IE6 only. If height is omitted the value of the min-height converts to the height for IE6 only. If the height and min-height are omitted the IE6 will display nothing. For the rest of browsers the value of height resets for auto. The min-height is optional and will work as expected for the modern browsers. The number of the pixels can be unique for each ContentPane. The height of a ContentPane is not the same as a height of the TabContainer. The 'mainTabContainer' is the id of the dijit.layout.TabContainer. The IE6 still uses the shared (biggest) height for all ContentPanes. But even though a problem still exists here is some improvement: a) no inner scrolling, b) if the value of height is bigger than the predefined one, the height is adjusted to the content. The main problem of this structure is a resizing. To manage the 'onresize' event it is too expensive, but you can workaround this problem using the min-width for a wrapper of the TabContainer (I use it here), or width for IE6. The vertical resizing doesn't collapse this sturcture. Not well tested with another browsers. 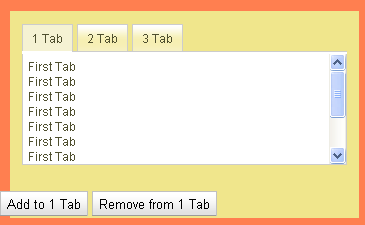 Not well tested as a nested TabContainer (see solution). The Dojo is a open source application and can be dramatically improved/fixed/changed in any time. Any changes for the dojo TabContainer can be a cause of a problem with this approach.